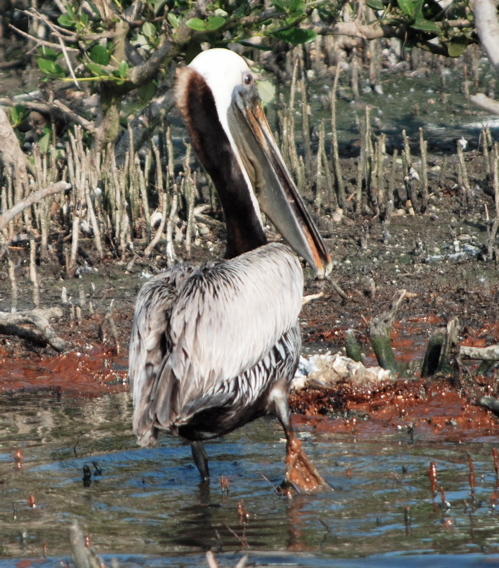 The United States Coast Guard considers me a felon now, because I "willfully" want to obtain more photos like these to show you the utter devastation occurring in Barataria Bay, Louisiana as a result of the BP oil catastrophe. If the Coast Guard has its way, all media, not just independent writers and photographers like myself and Jerry Moran, will be fined $40,000 and receive Class D felony convictions for providing the truth about oiled birds and dolphins, in addition to broken, filthy, unmanned boom material that is trapping oil in the marshlands and estuaries. We don't have $40,000 to spare, and have had to scrape the bottoms of our checkbooks as is to hire boats to take us to the devastation the Coast Guard, under the direction of BP, does not want you to see. Is this photo worthy of a felony conviction? Here is what BP wants you to believe--kayakers enjoying a peaceful paddle in pristine waters. Does the new boom law apply to them, as well? If so, it is time for BP to redo its public relations photography, unveiled at a community meeting in Houma, or we will have a ton of kayakers as well as journalists clogging Louisiana courts and prisons. One to five years in prison is a definite possibility for "willful violation" of the latest Coast Guard directive that flies in the face of the First Amendment. And, I guarantee you that writers and photographers will continue to try our best to use cameras and words to explain to those who have not been there exactly what is happening on our Gulf Shores. If we don't continue to try, Americans will no longer see the images and read the words that have been a voice for the voiceless fishermen and women, coastal residents of the Delta, and the battered wildlife. Working and reporting from the American Gulf Coast is starting to remind me of working in Rwanda and the Democratic Republic of Congo, where photos and recordings must be hidden on secreted flash drives at border crossings, and where interrogation by drunken border patrols certainly follows if one does not provide a proper "explanation" for visits to certain regions. In 2007 I was accused of being a "spy" and held by the secret police in Goma, DRC for having video of illicit "conservation" activities. Now the same sick feelings of fear, anger and helplessness is stalking my mind as I try to plan for the next round in south Louisiana. Never in my lifetime could I imagine that a foreign company could dictate my ability to move freely and openly in American territorial waters. 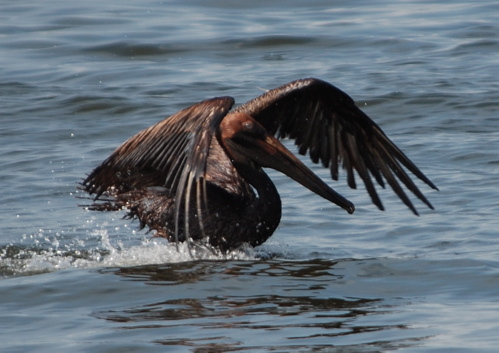 Already we have been challenged by the private security firm, Talon, on the oiled beaches of Grand Isle, and hassled by the Coast Guard and Louisiana Wildlife officials for not wearing flotation devices when it was not necessary. The law was on our side then, now the "law" is being used to limit free speech. What's next? Will media be totally shut down? Will we face assassinations like journalists do in Rwanda? I realize assassination is over-the-top, but when it crosses your mind, even for a moment, you know something is terribly wrong. On June 30 there was an uptick in press releases flowing from "Unified Command." The notice of the Coast Guard felony directive was buried along with EPA test results on Corexit, Thad Allen's "official" retirement from the Coast Guard, notices about NOAA, oiled wildlife-- at least nine press releases in the space of a few hours. Ordinarily, these propaganda pieces go in the file folder. The media ban disguised as a safety rule jumped out, but there was much analysis to do regarding the EPA test results on that day. So, the bogus 20- meter (65 feet) "safety zone" surrounding all Deepwater Horizon booming operations and oil had to wait until I could wrap my head around the implications. Frankly, I wanted to ignore it. The Coast Guard directive states, "The safety zone has been put in place to protect members of the response effort, the installation and maintenance of oil containment boom, the operation of response equipment and protection of the environment by limiting access to and through deployed protective boom." That statement is the most egregious smokescreen we have encountered on this story. 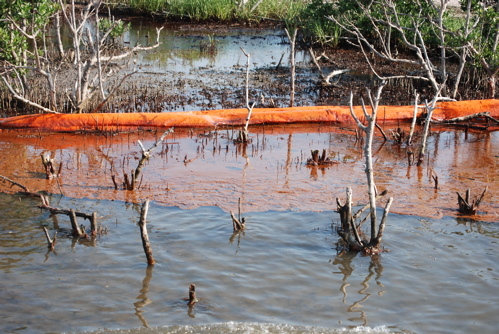 No one is maintaining the boom in Barataria Bay. Boom must be anchored, cleaned and replaced. This is not happening, and the Coast Guard, which reports directly to President Obama, does not want you to see this. Why aren't boom maintenance laws enforced? 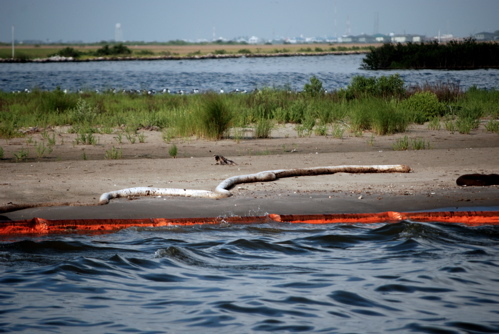 Instead, reporters now become felons for showing the American public the utter mess the Coast Guard, federal officials and BP have created in our once-beautiful waterways. Here is one boom plan that is not being implemented. "The boom is not working ... it is a joke," says Billy Nungesser, president of Plaquemines Parish, Louisiana, at a Thursday Senate hearing. 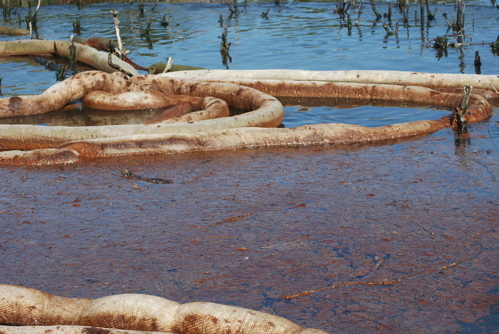 "It washes up on the shore with the oil, and then we have oil in the marsh, and we have an oily boom. So we have two problems." Senator Mary Landrieu (D-LA) has said that the boom only works in open ocean. Another under-reported aspect of this story is that the dispersant Corexit has done its job of hiding the catastrophe so well that booms cannot stop the oil. It slips, snakes and slides under the booms, which are inherently worthless in shallow waters, as Landrieu says. Here is what the Ports and Waterways Safety Act directs. 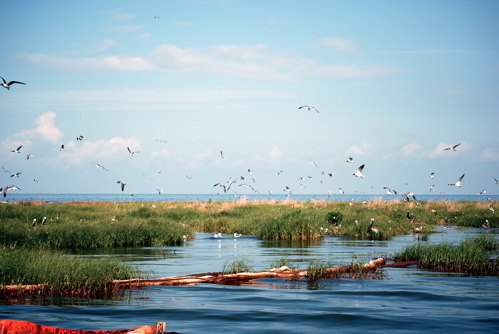 Is the Coast Guard ensuring the environmental protection of Barataria Bay? It is not, and Thad Allen and BP and the federal government do not want you to see the images that bring that fact home. The Coast Guard has a statutory responsibility under the Ports and Waterways Safety Act of 1972 (PWSA), Title 33 USC §1221to ensure the safety and environmental protection of U.S. ports and waterways. The PWSA authorizes the Coast Guard to "...establish, operate and maintain vessel traffic services in ports and waterways subject to congestion. Have you heard about the Coast Guard regulation (new) about booms and staying 20 meters away. Does this apply to unmanned booms? There is a felony penalty. Does this mean no boat traffic in Barataria Bay? It is hard to stay that distance if you are near the boomed islands. Her response was immediate and we cannot hold PIO officers accountable for the regulations. She did sum it up in no uncertain terms. The safety zone applies to ALL boom. In the case of Barataria Bay, the statement made in the press release," In areas where vessels operators cannot avoid the 20-meter rule, they are required to be cautious of boom and boom operations by transiting at a safe speed and distance," would apply. 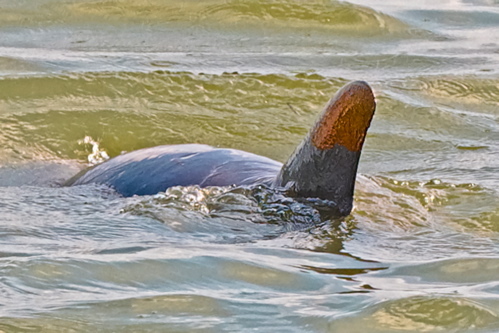 Do you want to see more photos like this oiled dolphin in Barataria Bay, taken by Jerry Moran? Permission to enter any safety zone must be granted by the Coast Guard Captain of the Port of New Orleans by calling 504-846-5923. Perhaps the American public should start calling him and demand that our rights of free speech and expression be reinstated in Gulf waters. Note: I am removing all copyrights on my work. Spread these photos far and wide. UPDATE: This in at 10:30 AM CST July 3. Perhaps media is protesting too much? Me, I don't buy the explanation. A sop to Cerberus. This directive hardly "protects" the people of South Louisiana. HOUMA, La. - The Coast Guard Captain of the Port of New Orleans has delegated authority to the Coast Guard Incident Commander in Houma to allow access to the safety zones placed around all Deepwater Horizon booming operations in Southeast Louisiana. The Coast Guard Incident Commander will ensure the safety of the members and equipment of the response before access is granted. 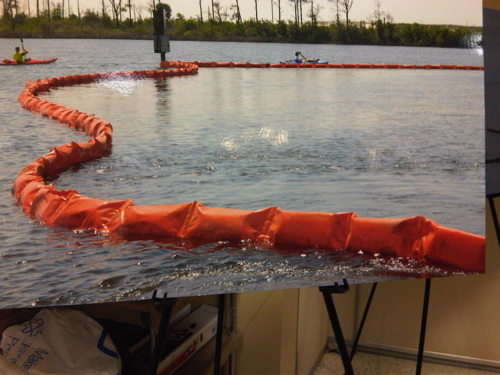 "The safety zones are intended to safeguard critical resources that are a vital part of the largest oil spill response in our history," said Chief Petty Officer Paul Roszkowski, Assistant Public Information Officer at Incident Command Post Houma, La. "We must take the steps necessary to preserve the assets needed as we fight to save the way of life of the people of Louisiana." The safety zone has been put in place to prevent vandalism to boom and to protect the members and equipment of the response effort by limiting access to, and through, deployed protective boom. Media wishing to gain access to the safety zones should call the Houma Joint Information Center at 985-493-7835. Do you really believe the Coast Guard will allow photos of this? This is BP and Coast Guard neglect, and does not reflect vandalism. Ask yourselves what motivations anyone could have to vandalize worthless boom material--material that is now doing more harm than good. It is past time for us to become critical thinkers.